We are in Ephesians 1:3-14, one long sentence from Paul telling us what our Spiritual Possessions are in Jesus. In Ephesians 1:3-6 we saw that we have Security from the Father. This means that He promises to make us holy through election and make us heirs through predestination. We saw last time in Ephesians 1:7-13a that our second blessing is Salvation from the Son. This salvation does not refer to going to heaven when we die, but instead points to the redemption and release from our captivity to sin so that we can live according to the will of God in our lives. In Ephesians 1:13-14, we learn about Sealing from the Holy Spirit. This sealing has special significance for the Ephesians Christians, which we will see in more detail as we study the text. So let us begin where we left off last time, which is half-way through Ephesians 1:13. Paul writes about what happened to them having believed. Or after they believed. While all three gifts of God are given to Christians at the moment of faith in Jesus, this third gift is specifically mentioned in connection to belief. When someone believes, they are sealed with the promised Holy Spirit. I want to comment on this word promised first, and then we will discuss the sealing. Have you ever wondered why Jesus Christ had to leave the earth? Have you ever wished that He was still here, walking around, teaching and training? Have you ever wished you could touch Him and eat with Him and talk with Him? I still long for this, but Jesus knows what is best for us, which is why He says this in John 16:5-8. Now I am going to him who sent me, yet none of you asks me, ‘Where are you going?’ Because I have said these things, you are filled with grief. But I tell you the truth: It is for your good that I am going away. Unless I go away, the Counselor will not come to you; but if I go, I will send him to you. When he comes, he will convict the world of guilt in regard to sin and righteousness and judgment. Do you see it? If Jesus had not left, the Holy Spirit would not have come. I don’t know why this is, but it is what Jesus said, and we need to trust it. When Jesus was here, it was wonderful. He could be seen and heard, and touched. But the drawback was that He could only be in one place at one time. But when Jesus left, He sent the Holy Spirit which He had promised, so that now, instead of Jesus being in only one place at a time so that those who wanted to hear or see Him would have to travel half-way across the world, we have the Holy Spirit, who is in every Christian all the time, every moment of every day. So I would still like to have Jesus here, but I think it is better that we have the Holy Spirit. This passage in John 16 tells us that He is at work in the world convicting the world of sin, righteousness, and judgment. And the rest of John 16 tells us that the Spirit teaches Christians and guides us into truth. He can do this everywhere and all the time without growing weary or hungry as Jesus did. Yes, I sometimes wish Jesus was here, but I am thankful for the Holy Spirit. Jesus promised the Holy Spirit would come, and in Acts 2 He came, and has been with us ever since. That is the promise Paul refers to in verse 13. So what is this sealing that verse 13 talks about? It says we have been marked with a seal. In Paul’s day seals were used in at least four ways. First, seals were sometimes put on letters to guarantee that it was genuine and that it was written by who it claimed to be written by (1 Kings 21:8; Esther 8:8). Kings might seal their letters with a signet ring. We do something similar when we get a document notarized. A seal was also sometimes placed on goods or merchandise that was traveling from one place to another to indicate who they belonged to and where they were going. It indicated ownership (2 Cor 1:22; Rev. 7:2; 9:4). Again, we do this with our possessions today all the time. We write our names in our books, or on our kid’s clothes when they go to camp. Ranchers brand their cattle. They are placing a mark on it to show ownership. The third way seals were used in Paul’s day was to show something was authentic and approved (John 6:27). Sometimes when we buy clothes, in one of the pockets will be a little piece of paper saying it has been inspected and approved by someone. The fourth type of seal was for protection or warning. Remember when Jesus was put in the tomb, Pilate told the soldiers to put his personal seal upon the tomb (Matt 27:66; Eph 4:30). This was to protect the tomb and warn everyone to stay away and keep out! So Paul says here that God has placed a seal upon us as well. It is to guarantee that we are genuine, it shows ownership, who we belong to, it shows that we are approved, and it provides us with protection or security. Now, is this mark visible to you and I? No. We cannot see it. We cannot put our finger on it and say “Here it is.” Neither is it revealed by some sort of spiritual manifestations like being slain in the spirit or speaking in tongues or laughing hysterically. The sealing of the Spirit is invisible to us in the physical realm. According to Galatians 5:22, the fruit of the Spirit is love, joy, peace, patience, kindness, goodness, faithfulness, gentleness, and self-control. So if a person has some or all of these, it is a good indication that they also have the Holy Spirit. We cannot see the wind, but we can see what the wind does. It is the same with the Spirit. So this sealing of the Spirit is an invisible mark. The Spirit regenerates us (John 3:3; Titus 3:5). This is the act of God which gives us eternal life when we believe. The Spirit also indwells us (John 14:16-17). This is the Spirit coming to live within us and abide or remain within us. The Spirit baptizes the believer (1 Cor 12:13). This is a spiritual baptism, not a water baptism. Water baptism symbolizes what has already happened to us spiritually. This spiritual baptism gives us the basis for victory over sin. We are also sealed with the Holy Spirit (Ephesians 1:13-14). This is what we are discussing now. It should be noted that all four of these things are one-time events that happen instantaneously the moment we place faith in Jesus for eternal life. Once they happen, they cannot be repeated and they cannot be reversed. In other words, during your life, the Holy Spirit will not repeatedly baptize you. Some people teach this, but that is because they do not understand the Spirit baptism. These events cannot be reversed either. You cannot become un-baptized any more than you can become unborn. You cannot become un-regenerated any more than you can become un-alive. There are people who are unregenerate, but that means they have never been saved, not that they were saved and then became unsaved. So these four actions of the Holy Spirit, regeneration, indwelling, baptizing, and sealing, are one time events that happen at the moment we receive eternal life, and which cannot be repeated or reversed. Now some of you may be wondering about the filling of the Holy Spirit. The filling of the Holy Spirit is a truth taught in Ephesians 5:18. We will deal with it in more depth when we get there, but let me just say now that the filling of the Holy Spirit is also something that happens to the believer, but it is something that can be repeated and can be lost. It is not something mystical that takes place only when there is goosebumps, shivers, chills, and special miraculous signs. Being filled with the Spirit is simply being controlled by the Holy Spirit. That’s all there is to it. We stop being filled with the Holy Spirit whenever we try to take over the control of our lives. Whenever we let sin get a foothold in our lives. We need to frequently be filled because as sinful humans, we leak. Again, being filled with the Spirit is most often not accompanied by miraculous signs and wonders. But I’m getting ahead of myself. I know you have a lot of questions, but let us save the filling of the Holy Spirit for when we get to it in Ephesians 5:18. So Ephesians 1:13 tells us that by believing, we have been sealed with the Holy Spirit. By the way, the only other book in the New Testament that talks about the sealing of the Holy Spirit is Paul’s second letter to the Corinthians. So the question arises, “Why did Paul only mention this sealing in these two letters?” The reason has to do with the towns of Ephesus and Corinth themselves. Both Ephesus and Corinth were great centers of the lumber industry in ancient times. Then they would do two things. They would cut a certain wedge upon each log that they had bought which marked that log as bought and paid for and to show who it belonged to. This was called the seal. The second thing they would do was to put a down payment on the logs – a deposit – and when the logs were delivered or picked up, they would then pay the rest of the money. Paul talked about this seal in Ephesians 1:13, and look what he mentions now in Ephesians 1:14. 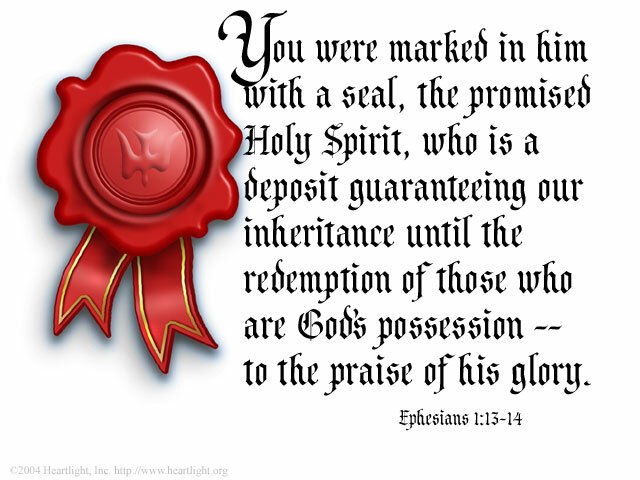 Ephesians 1:14. who (this is the Holy Spirit) is a deposit guaranteeing our inheritance until the redemption of those who are God’s possession—to the praise of his glory. 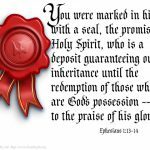 The Holy Spirit is a seal and a deposit guaranteeing our inheritance. It is just like those logs. The Holy Spirit will provide us with new bodies and an inheritance when we finally get to heaven, but we have a sealing in the Holy Spirit right now which promises and guarantees that this inheritance is ours and is waiting for us. It is like a deposit, says Paul. 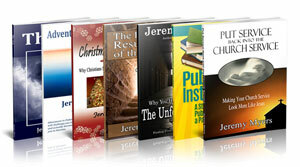 God has made a purchase, and just to prove that He is going to follow through on His purchase. He has made a down payment. He has given a deposit in the form of the Holy Spirit. When we buy a car or a house, we make a deposit. We give a down payment. This tells the seller that we are promising to buy it. That is what God has done here. He has given a deposit to us. He has promised that what He has begun, He will finish. It is also interesting to note that the Greek word here for deposit is the modern Greek word for an engagement ring. And we all know what an engagement ring means. it is like a deposit. It means that two people are promised to each other or pledged to be married. God has promised to come for us and make us heirs of Himself. This deposit guarantees our inheritance in heaven. The deposit is a little bit of heaven here on earth. Also in Ephesians 1:14, there’s the inheritance that awaits us in heaven, and there’s the redemption of our bodies. We looked at redemption previously when we considered verse 7, and Paul is just reminding us of the similar idea here. We are heirs of God and co-heirs with Jesus Christ. We have been redeemed from our captivity to sin, and because of the sealing of the Holy Spirit, we will also experience the redemption of our bodies. We have been delivered from the penalty of sin, the power of sin, and ultimately, finally, eventually, when we receive our new bodies in eternity, we will be delivered from the presence of sin. As great as the gift of the Holy Spirit is, He is only a deposit, a foretaste, a small glimpse of the beauty, glory, greatness, and majesty that awaits us in eternity with the redemption of our bodies. And once again, just in case we forgot, Paul tells us that this is to the praise of His glory. It is all for God’s glory. Not ours. It is for God’s glory alone that He is giving these wonderful riches to us. Paul has made us aware of three incredible riches that we have in Jesus. We have Security from the Father. He has promised to make us holy and make us heirs. Second, we have Salvation from the Son, and today we have seen that we have Sealing from the Holy Spirit. The reason is because we have not learned to live in light of the Security we have from the Father, the Salvation we have from the Son, and the Sealing we have in the Holy Spirit. Paul has talked about these three gifts in verses 3-14. Just like that women whose marriage was on the rocks, the American church has so much, but what good is everything if we are now aware of what really matters. Of course, like all possessions, it’s not enough just to have them, they need to be used. We will begin to learn more about our spiritual possessions next week and how we can begin to draw on them.